We are delighted to, once again, support the Windsor & Eton Living Advent Calendar. This is the third year running that we’re hosting the magical event from our offices in the heart of Windsor. 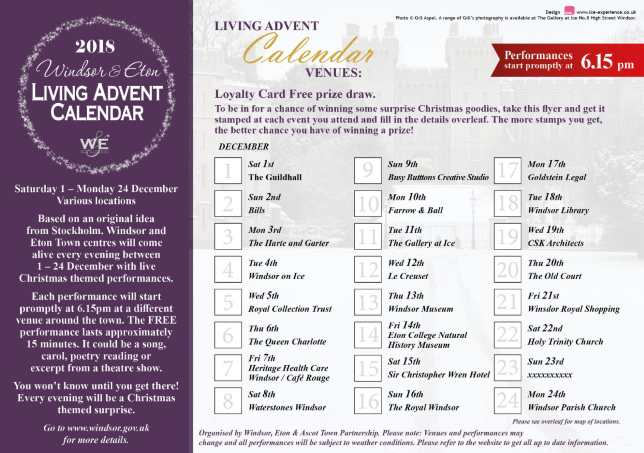 The Living Advent Calendar is a collaborative project run between 24 local businesses to provide live entertainment every evening from 1 to 24 December 2018. Following the success of last year’s event, we have invited the super STERF Singers (St Edwards Royal Free School Choir) back, to sing from our office as part of the Living Advent Calendar. 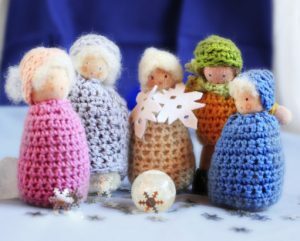 They’re sure to get us all into the Christmas spirit with a range of festive songs and carols. The festivities will start at 6:15pm on Monday, 17th December at the Goldstein Legal offices on 11 High Street, Windsor. You can listen to the choir sing from outside our offices where they will delight the public with their festive repertoire. Then you’re welcome to pop inside afterwards where we’ll be serving tasty treats and festive fizz! Don’t forget, the more Windsor & Eton Living Advent Calendar events you attend, the greater chance you have of winning the fantastic prize draw. See the leaflet image below for full details about where each performance will take place and how to take part in the prize draw. Visit our Gallery to see photos from last year’s event. Watch this space, as we’ll be adding highlights from this year’s performance there too! What is in Store for UK Franchising in 2019? Season’s Greetings from Goldstein Legal! Unsubscribe anytime by emailing unsubscribe@goldstienlegal.co.uk, calling 01753 865165 or clicking 'unsubscribe' in emails you get from us.